During the summer months, the "European monsoon" sets in across the western half of the continent Ð a period of cloudy and showery weather which begins with the onset of westerly winds in mid June and continues into September. At other times of the year the prevailing wind direction aloft is more variable, bringing alternating spells of warm and cold weather. This does not imply that cold air does not spread southward in summer, for cold spells with unstable weather come at intervals of a week or two, just as in North America. In fact, the weather along the eclipse track is similar in character to that found in the northern plains States and Canadian prairie provinces, with frequent weak disturbances bringing showers and thundershowers. Intervals between disturbances often come with fine and dry weather, though these are less frequent in Europe than in North America. Prolonged dry weather in Europe comes when a high pressure system builds northward from the Azores anticyclone. The varied topography through Germany and Austria creates a wealth of climatic sub-regions, but these are defined more by temperature and precipitation differences than in cloudiness. Cloud patterns are strongly modified by the higher mountain ranges, particularly the Alps and Jura Mountains to the south of the eclipse track, but the main effect of these barriers is to create cloud rather than dissipate it. The prevailing westerly and northwesterly winds are forced to rise up these slopes, cooling and causing clouds to form. Southerly winds, flowing over the mountains toward the eclipse track, would tend to dissipate the cloud and bring dry sunny weather on the downhill side (a process known as a chinook in North America and a foehn wind in Europe) but southerlies are relatively rare during August and the benefits of the mountain barrier are not likely to be realized. In spite of the influence of the Alps, there is a steady trend to sunnier skies as the eclipse track proceeds across Europe, and the distance from the Atlantic moisture source increases. The percent frequency of clear skies is about 18% over Normandy on the Channel coast and barely rises above 20% throughout the length of the eclipse track over the rest of France. However, beyond this point the maritime character of the westerly winds becomes more continental, and sunshine frequency begins a slow climb through Germany and Austria. This improving trend is interrupted briefly through central Austria where a branch of the Alps reaches down to the eclipse track and brings an increase in cloudiness. The effect is quite dramatic Ð the number of hours of sunshine in summer drops nearly 25% across middle of Austria in comparison with its eastern and western borders. Mean August cloudiness decreases from 60% near Cornwall to 50% near Paris. The mean number of hours of sunshine grows from 6.5 over France to just over 8 hours in Austria, with a matching increase in the frequency of scattered cloud conditions. 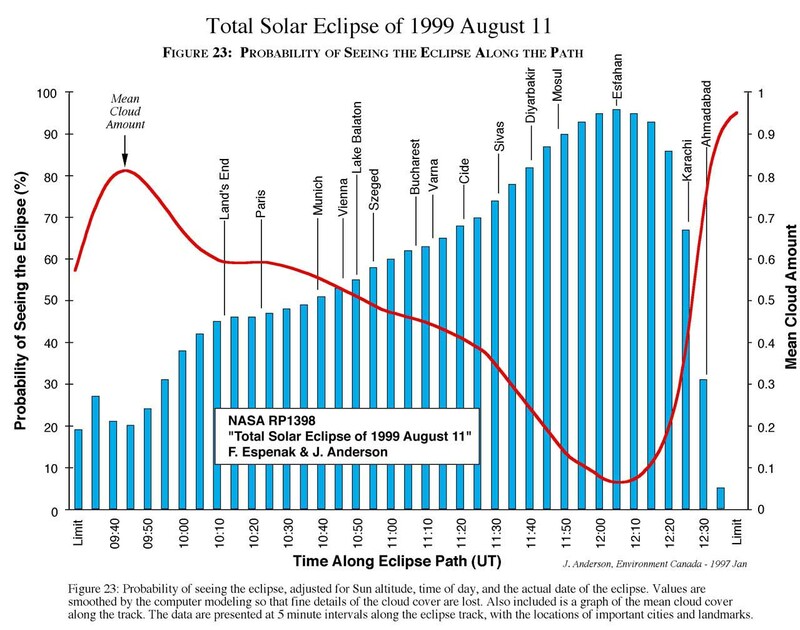 Figure 23 shows little difference in the prospects between Land's End and Paris, but then a slowly growing probability of seeing the eclipse through Germany and Austria. There is not much to recommend one part of the track over another other than to suggest that eclipse viewers head eastward to take advantage of the slow climatological improvement. A much more reliable option is to simply await the weather forecasts in the days ahead of the eclipse and pick a site which is forecast to be sunny. While long range forecasts are available out to ten days, they do not become particularly reliable until about five days in advance of the event. More will be said about this later. Summing up then, and extracting the smallest details from the statistical record, the best sites along the center line in France will be found from Compi�gne, past Reims, to Metz, though the advantage gained is very small. In Germany the most suitable climatology is found from Ulm past Munich to the Austrian border. In Austria, climatology favors a location near the Hungarian border south of Vienna, though a location near the German border comes in as a close second.